U.S. Often Issues Travel Warnings, But Lately The Tables Are Turned : Parallels The State Department regularly issues travel alerts for U.S. citizens. 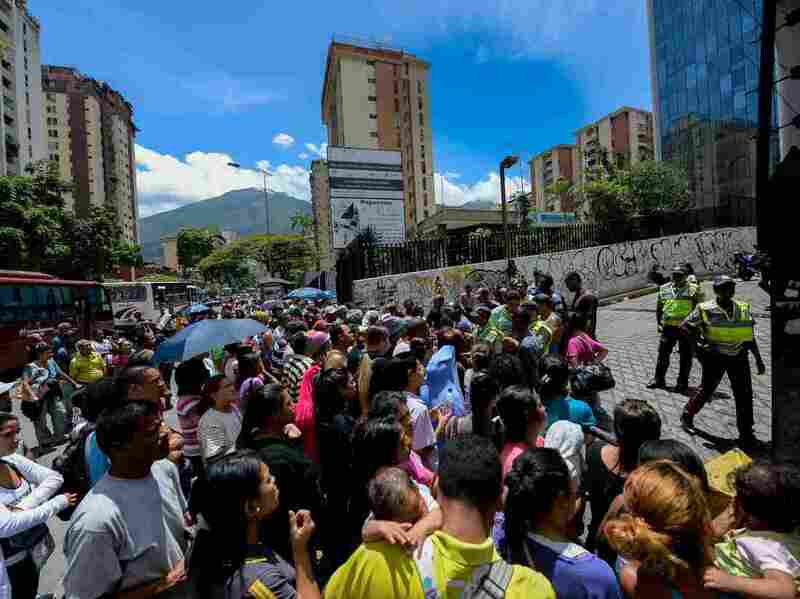 Now U.S. gun violence has led other countries to urge their own citizens to show caution when visiting the U.S.
People line up to buy groceries outside a supermarket in Caracas, Venezuela's capital, on July 13. The State Department issued a travel warning for the country on July 7. Four other countries have been the subject of U.S. travel warnings since July 1. It's vacation season. Your suitcase is packed and you've got your tickets in hand. And if you're heading overseas, you may want to check to see if the State Department has issued a travel alert or warning for your destination. Hardly a week goes by that some warning isn't issued, about everything from natural disasters to terrorist threats. These warnings can have a sharp impact on travelers — and diplomatic relations. If you go to the State Department's website, you can find all sorts of travel information for more than 180 countries. That includes security risks. A travel alert will be issued for a country or a region if there's a short-term security threat, such as protests over an upcoming election or civil unrest — or even the threat of dangerous natural events such as hurricanes or typhoons. Mark Meader, with the American Society of Travel Agents, says a more serious, longer-term situation could warrant a travel warning. "That might include unstable government or civil war, intense crime or violence, or even very frequent terrorist attacks," he says. "In that case, the State Department would consider you not going to those countries at all during that period." Those countries include places like Somalia, Libya, Pakistan and Saudi Arabia. Former State Department official Shamila Chaudhary says it's different when more popular tourist destinations are listed as a security concern. It can have a economic impact on those countries. "Countries like Turkey and Israel and Mexico that have a heavy tourism industry generally perceive U.S. travel warnings as negative, especially because there is regular American travel to these countries," she says. The travel warnings can also affect foreign relations, says Daniel Benjamin, who used to head up counterterrorism at the State Department. He remembers when one was issued for Europe in 2010. "The Europeans, particularly France, went completely ballistic," he says. Benjamin had to meet with France's counterterrorism czar in Paris a couple of days later. "I remember so clearly being in this wonderful, ornate office, and this general who I have very high regard for just reamed me," he says. "And it was quite a shocking experience, because my experience with the French [is that they] are quite polite about their diplomacy. But they were very, very angry." The State Department says its assessments are drawn from intelligence, local police sources and trends. It insists they are not a reflection of relations between the countries. Still, Chaudhary says some countries see them as retaliatory or political in nature. "The countries who are the subject of the warnings tend to politicize this issue," she says. "And the United States government has been lobbied by countries to get rid of the travel warning." But it's not a one-way street. Several countries have issued their own warnings for travel in the U.S. On July 8, the Bahamas advised its citizens to exercise extreme caution in the wake of recent shootings by U.S. police of young African-American males. "In particular young males are asked to exercise extreme caution in affected cities in their interactions with the police," the advisory says. "Do not be confrontational and cooperate." The United Arab Emirates, Bahrain and New Zealand issued similar warnings.